Formula One: Alonso and Hamilton fastest in Chinese Friday practice! 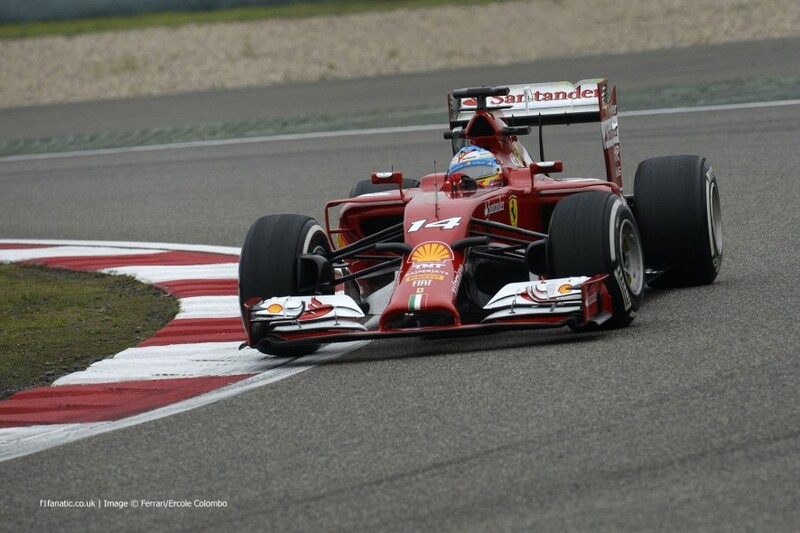 Home » Formula One: Alonso and Hamilton fastest in Chinese Friday practice! The Chinese Grand Prix weekend began today, with Fernando Alonso and Lewis Hamilton being the two fastest drivers in the two Friday practice sessions in preparation for Sunday’s race. In first practice, Ferrari were the fastest and slowest cars on track, with Alonso taking the fastest time and Raikkonen down in 22nd. Alonso, the winner of the race last year, was 4 tenths of a second faster than Nico Rosberg. Daniel Ricciardo was 3rd fastest in his Red Bull, 2 tenths ahead of Jenson Button. Nico Hulkenburg separated the two McLaren’s in 5th, with Kevin Magnussen just behind on his first visit to the circuit. Jean-Eric Vergne was 7th, just ahead of Lewis Hamilton, who ended the session early when he suffered a mechanical failure. As a result, the man who has won the last two Grand Prix leading up to this weekend only completed 9 laps. Sebastian Vettel completed 10 more laps than Hamilton, but was still a tenth behind in 9th place. Felipe Massa was just slower than Vettel and ended the session 10th fastest. Kvyat was just outside of the top 10 after spinning into the gravel at turn 1. The Russian wasn’t the only driver to have an off track excursion, with Pastor Maldonado going off track at turn 9 after being distracted by his steering wheel. He was caught by surprise when his car entered the gravel and spun, but managed to get his Lotus back on track. Felipe Nasr and Giedo van der Garde were the only substitute drivers in the sesion, with the pair ending the session in 14th and 15th place for Williams and Sauber respectively; with van der Garde two seconds faster than Gutierrez in the sister Sauber. 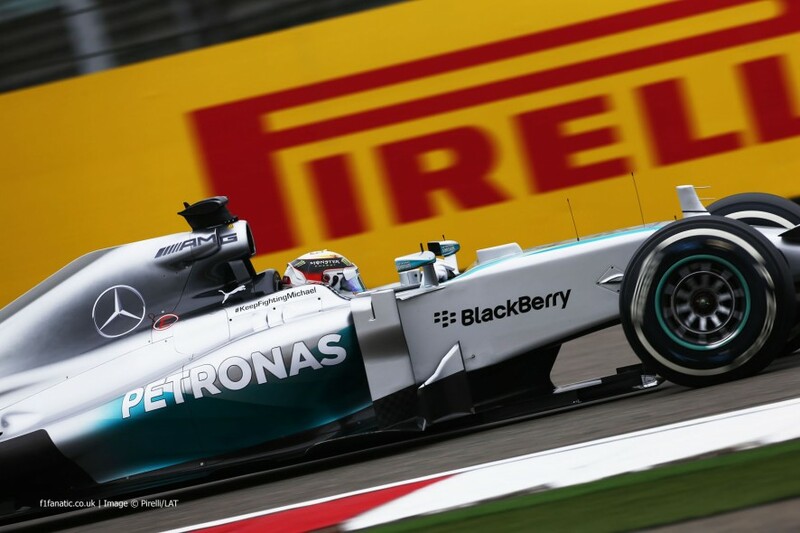 Lewis Hamilton recovered from his dismal first practice to top the second session after missing the first half an hour of running. The team managed to get his car out with an hour to go in the session, with Lewis emerging on the soft tyres to set the fastest lap, 1 tenth ahead of FP1 leader Alonso. Lewis later went on to do a race simulation, but abandoned it near the end of the session after saying that something “didn’t feel right” on the car. Rosberg was around 4 tenths slower than Hamilton in third place, but had been told to back off in the final sector due to a yellow flag. This flag was caused by Pastor Maldonado, who came into the pits too fast and hit the wall in a similar fashion to how Hamilton ended his Chinese Grand Prix in 2007. The two Red Bulls were 4th and 5th, with Ricciardo 3 tenths faster than Vettel. Massa was 6th fastest ahead of Kimi Raikkonen, who ran for the first time after missing practice 1 to take 7th in his Ferrari. Jenson Button, the 2010 winner of the Chinese Grand Prix, was 8th fastest ahead of Romain Grosjean, who showed that the Lotus was seemingly improving race-by-race. Daniil Kvyat completed the top 10 for Toro Rosso.